With all of the excitement of the release of our latest collection, Make Your Wish, we have noticed that many of you have had questions about the sizing of the items and the washing/care instructions. So, we decided to write a blog post that should answer all of your questions. If you still have questions, please feel free to email us at info@taylorjoelle.com. This collection is now available for pre-order and should ship by April 17, 2013. We recommend machine washing on cold and line drying all items from this collection. The collection as a whole is pretty true to size. We are starting to do more of our items in even sizes. So if you are confused about what to order, we would suggest that a 2 is more of a 2/3 and 4 is more of a 4/5 a 6 is more 6/7 etc. If the item does not fit, we do offer refunds or exchanging. You would just need to pay to ship it to us. We have tried this on an 8 year old and on a 2 year old and it fits them both. These have the same fit as our original Lace Top With Ruffle Sleeves, the sleeves are just shorter for the warmer weather. These run true to size. 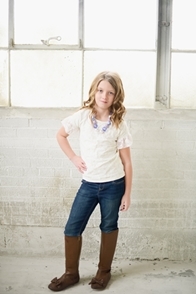 We wanted to over a wide range of sizes for this shirt because it is the perfect basic shirt. It works great on it’s own, with skirts or pants, and under dresses (like our knot dress). These run true to size. 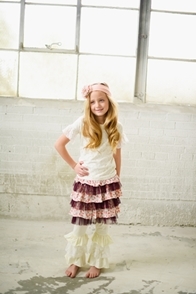 The skirt is an elastic waistband and stretchy, so it fits a larger range. These run true to size. Some of our leggings in the past have been known to run small. That is not the case with these. 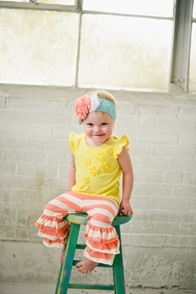 These have the same fit as our Striped Ruffle Leggings from the Midnight in Manhattan collection. These are full length leggings, they are not meant to have a capri fit. 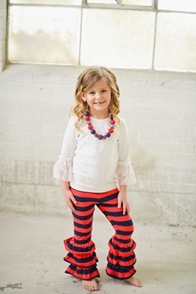 We also brought back more stock of the original Striped Ruffle Leggings and a new style, Navy and Red Striped Ruffle Leggings. 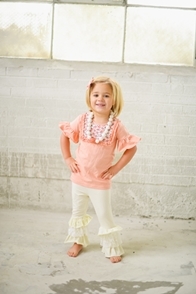 These have the same fit as the Ruffle Leggings in the Make Your Wish Collection and are also available for pre-order. Make Your Wish Accessories – Giveaway!